The opening night of my solo exhibition “Layers” is only 1 month away. This week I finished my last painting and most of my sculptures. Lots of things still to do such as the naming of all works, working on an installation and of course promoting the show. This series of work consists of encaustic paintings, illustrations, and sculptures. The works within this exhibition are an exploration of human existence and identity. We all have different layers to our personalities, due to the various roles we play in our personal lives, our careers, and the fundamental personality traits we were born with. We put on masks for protection, disguise, performance, or entertainment, and some experiences can cause cracks in our layers. Some of our layers are visible and some are hidden, but at the core, we are more alike than different. Over time, we end up becoming complex human beings with many layers. To truly see somebody for who they are, do we chip away at those layers or is this accumulation of layers what truly makes us into who we are – complex and beautiful. Each of the encaustic painting and hand-painted nesting dolls is a portrait. Each layer of wax within the paintings expresses a different part of the subject’s personality through abstract landscapes, photography, transfers of graphic patterns, and illustrations. The nesting doll sets each consist of 3 dolls and are hand-painted using acrylic paints. Each doll depicts an animal symbolizing a part of the subject’s personality. The clay sculptures focus on the damage life can cause. Instead of hiding our imperfections we should embrace them and realize that all experiences, good or bad, make us into who we are. This philosophy is underlined through the integration of the centuries-old Japanese art of Kintsugi, through which broken pottery is repaired with 18k gold, showing that if we embrace our history we become more beautiful. Here is a sneak peek of some of my pieces and a fun promotional video for the show. 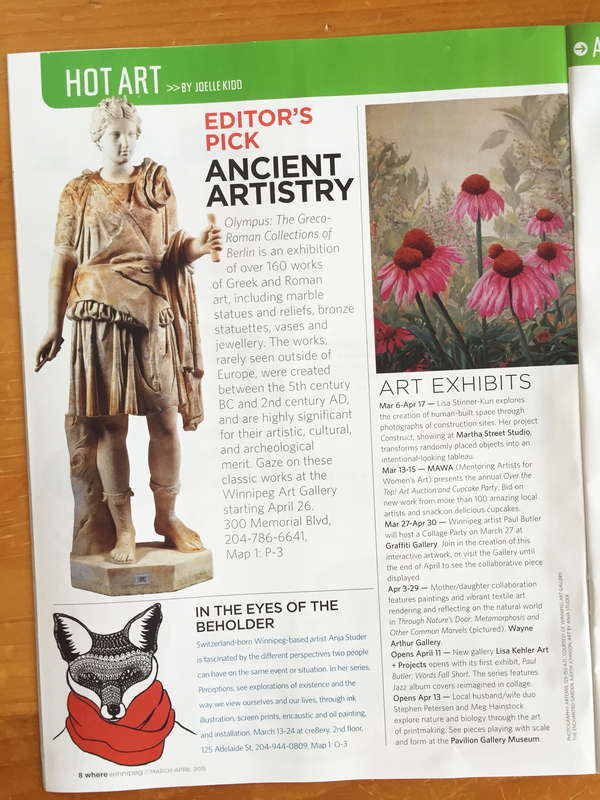 The exhibition will be at cre8ery gallery and runs May 10-22. The opening reception will be taking place on May 10 from 7-11pm. After May 10 the gallery hours are Tuesday-Friday noon-6pm and Saturday noon-5pm. I hope you can all make it to the opening night on Thursday, May 10, 2018, 7-11pm. I had a very inspiring afternoon at a fundraiser event for the Manitoba Crafts Museum. There were many different demonstrations and I had the opportunity to participate in three workshops. I attended the “Leather Work” workshop by Jan Castillo, where we learned the basics of leather working by making a small coin purse. Loved it and will definitely do this again. The second workshop I took was “Metis Beadwork” by Jennine Krauchi. Her work is just stunning. We learned floral beadwork using a two-needle technique. After spending a hour at the workshop I spent a couple more hours tonight finished up my little flower. A very humbling experience. I ended the afternoon by learning a Japanese braiding technique called Kumihimo taught by Susan Styrchak. Hoping to transfer the simple string into a bracelet. I really enjoyed learning some new techniques today and I will for sure participate in this event again next year. 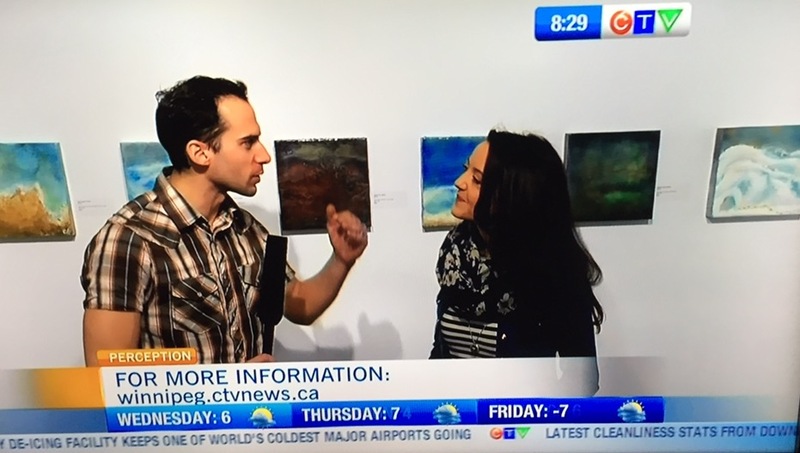 I wanted to share some of the media coverage I have received for my current art exhibition “perception” at cre8ery gallery in Winnipeg. 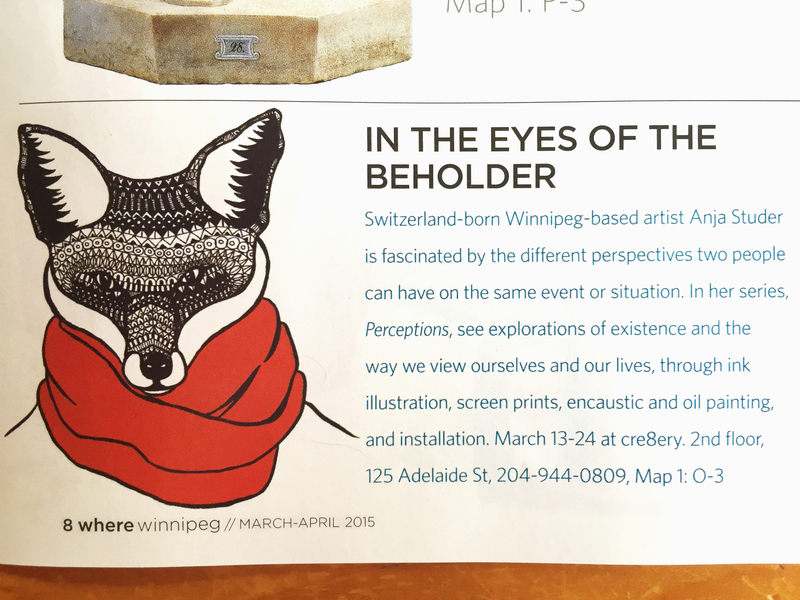 The exhibition is still running until March 24, 2015 and the gallery hours are Tuesday to Friday noon-6pm and Saturday noon-5pm. I will be at the gallery this Saturday from 2-5pm and on Tuesday from 2-6pm. Come by for a private tour! Thanks everybody for the ongoing support! 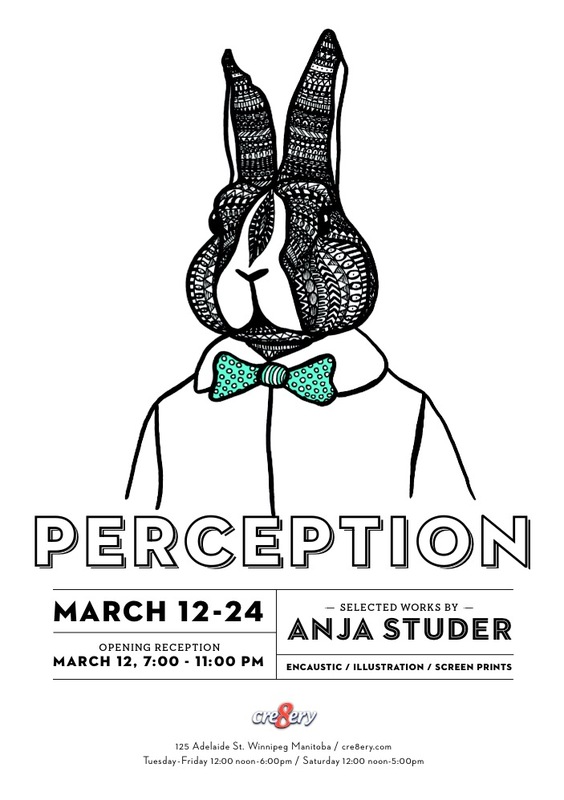 The opening night of my solo exhibition “Perception” is only 4 days away . I am busy with lots of final preparations and with preparing for my parents arrival on Tuesday. I am very excited to show this new series of work consisting of illustrations, screen prints, encaustic paintings and a large format installation. This series is based on the idea that two people can have the same experience but perceive it so differently. While working on my last solo show “Home Sweet Home,” I discovered that my perception of growing up is quite different from my brother’s – that it’s not only people, events, and experiences but rather our perception of those that makes us who we are. I wanted to take this opportunity to invite you all to the opening night on Thursday, March 12, 2015, 7-11pm at cre8ery gallery, 125 Adelaide, 2nd floor. I hope you can join me for this exciting night! In case you are wondering what I have been up to over the past 2 years… well where to start. I have had very little time for my art due to my new job as the Senior Project Manager, New Media at the Canadian Museum for Human Rights. It’s been inspiring, crazy, tiring and rejuvenating all at the same time. The museum fully opened on November 11 and I switched my attention from opening a museum to getting ready for my exhibition. It’s been a lot of long hours but hey I was already used to that after working at the museum. I have loved being able to get lost in my art again and being able to spend 8 hours at a time in my studio creating and playing. 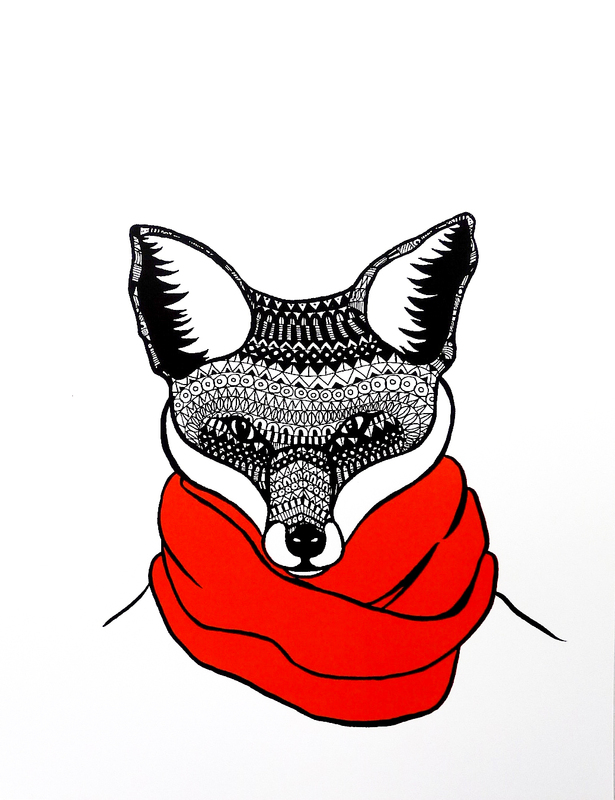 This new series being exhibited consists of illustrations, screen prints, encaustic paintings and a large format installation. 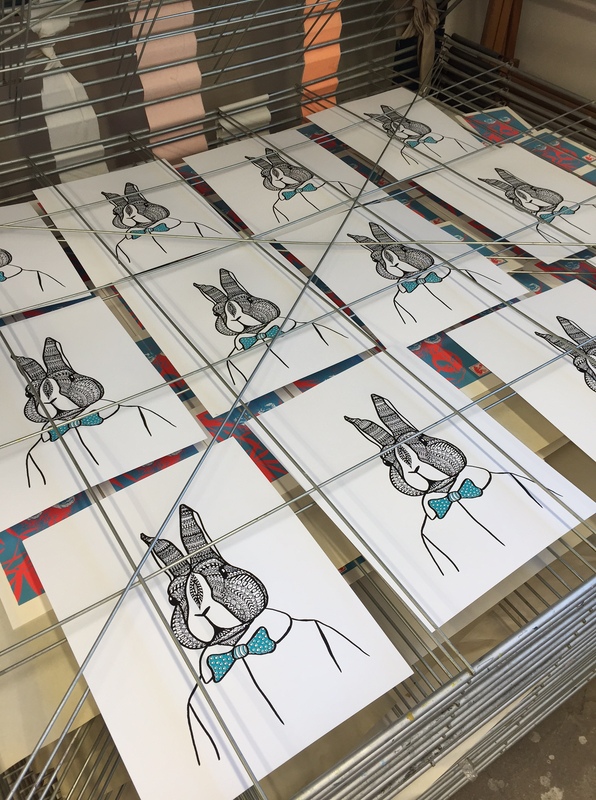 Here is a sneak peek of what I have been working on… More details on the opening night to come in the next few days but please mark your calendars – the opening night is taking place on March 12, 7-11pm at cre8ery gallery in the Exchange. My good friend and fabulous artist Charlene Brown and I are doing a one day studio sale this Sunday. The sale is taking place at clayhaus studio at 1178 McMillan Avenue, 10am to 5pm. 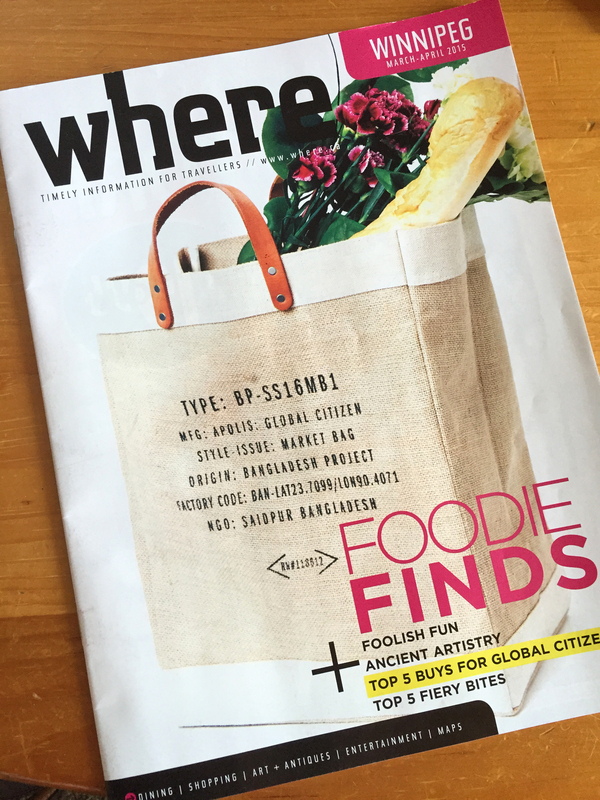 Looking to get some Christmas shopping done? 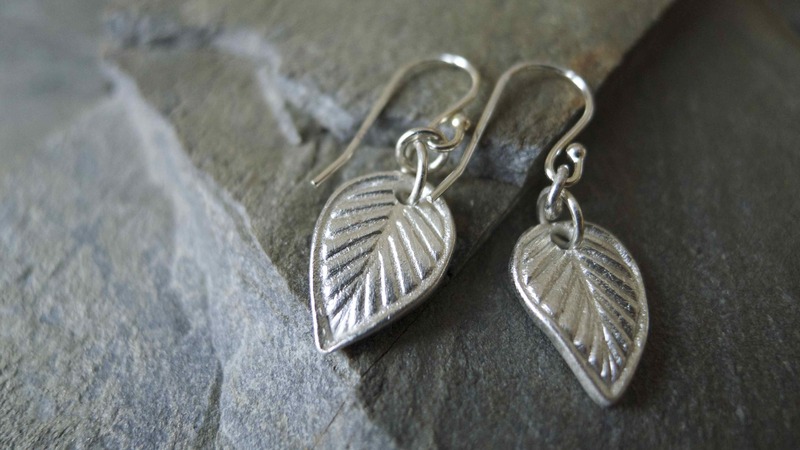 Do you have an eco-fashionista on your list? A piece of my jewelry might be the perfect gift for her. I have a line of silver jewelry that is made from recycled pure silver, beach glass I collected on my travels and recycled fresh water pearls . All pieces are handcrafted and one of a kind. A few years back I went to see a talk + demo by the local artist Tim Schouten at the WAG (Winnipeg Art Gallery) with my friend and fellow artist Charlene Brown. 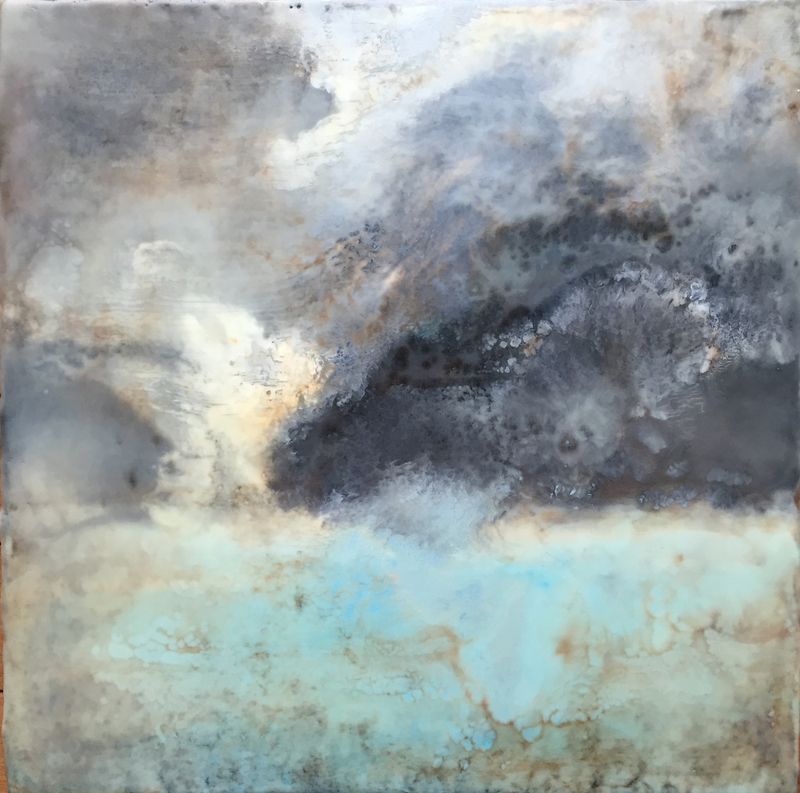 We had both seen Tim’s encaustic paintings and were interested in learning more about his work and about encaustic in general. Seeing him work was fascinating and the following summer I made sure to visit his studio (http://www.watchthewave.ca/). I was intrigued and scared by this ancient medium and wanted to try it out so badly. I ordered some pre-made encaustic paints and started exploring. It was a lot of trial and error and a lot of playing with different tools – and playing is the key word here, as it truly feels like playing. 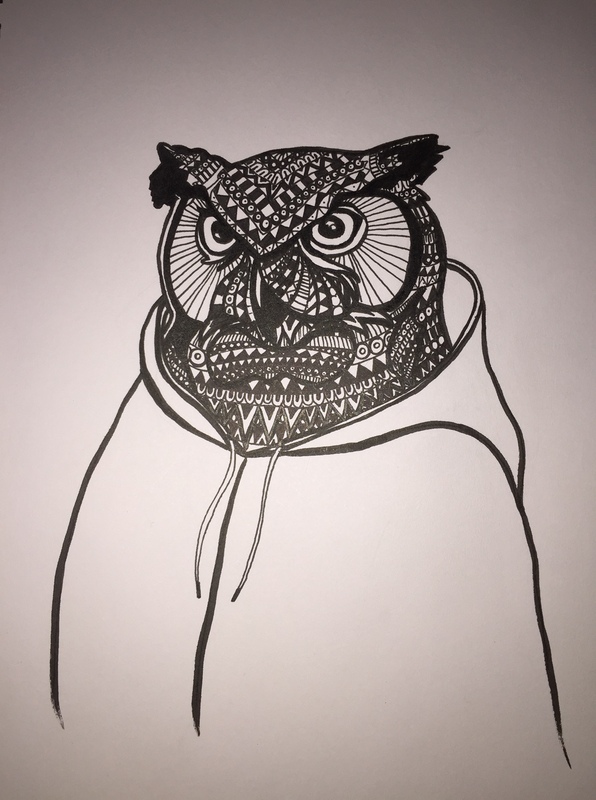 I instantly fell in love with this medium. I have taken a workshop and have learned how to make my own encaustic paints from bees wax and damar resin. 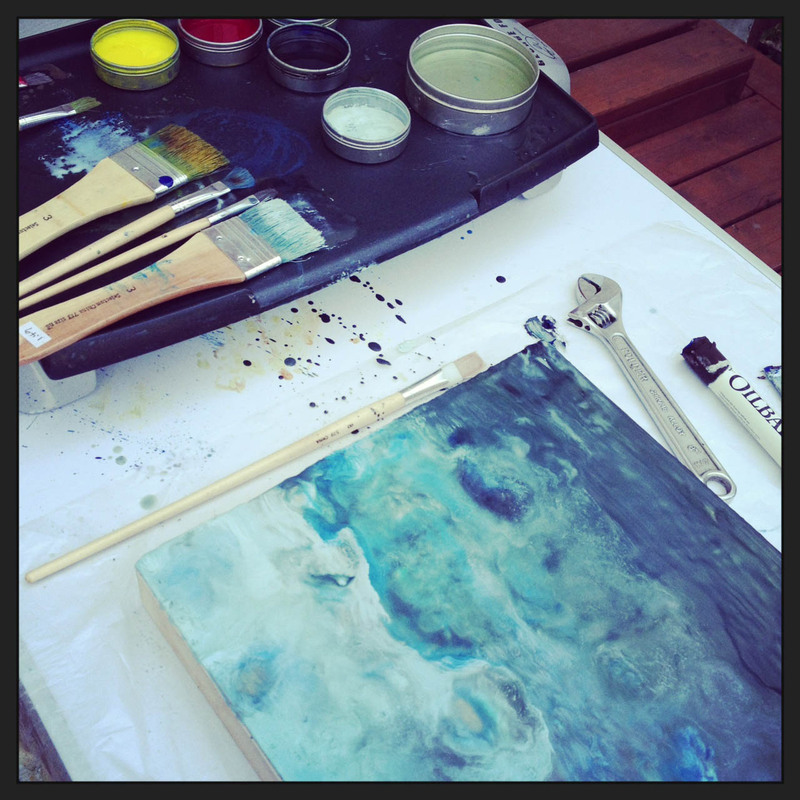 I don’t have proper ventilation in my studio so I decided to set up my encaustic studio on our deck. Painting outside solved the ventilation issue and I have to say it intensified the sense of playing as it reminded me even more of being a kid playing outside. I started working on my next solo show (March 2015 at cre8ery gallery) exploring the theme of dreams and illusions. 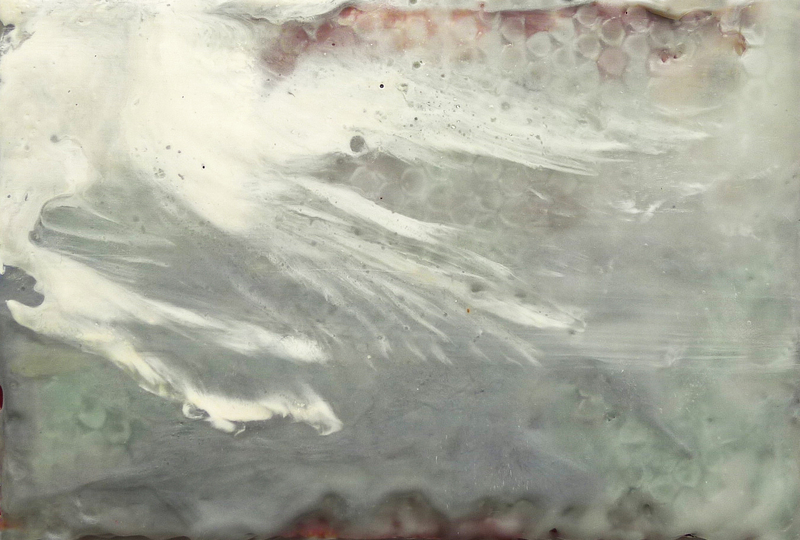 6 of my encaustic pieces will be exhibited at cre8ery gallery Nov. 5 to Dec. 10, 2013. Gallery hours are Tuesday & Thursday 12-8pm, Wednesday & Friday, 12-5pm and Saturday 12-4pm. 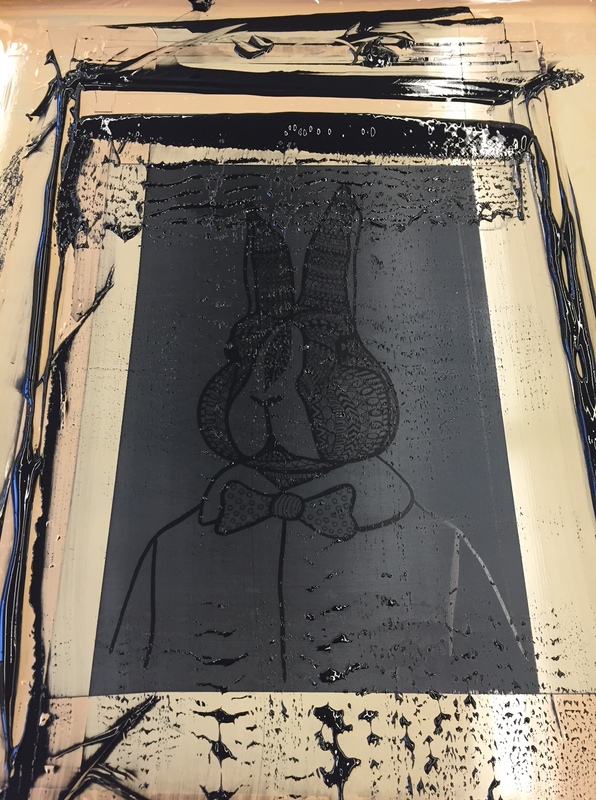 The word encaustic comes from Greek and means to “burn in”, which refers to the process of fusing the paint. Encaustic is a paint composed of beeswax, damar resin and pigments. The term “encaustic” is often used to describe both the paint itself, and the method for using it. 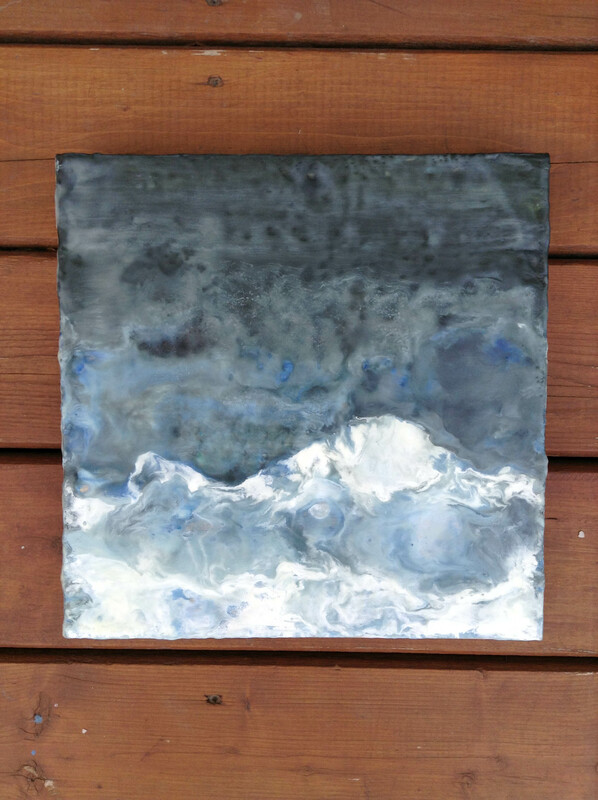 Encaustic paint is applied molten to an absorbent surface, and then fused, (or re-melted), to create a variety of effects. Unlike other paints, encaustic is never wet or dry – it goes from a liquid to solid state and back again in seconds, which means additional layers can be added immediately, without disrupting your composition. Once the surface has cooled, the paint has reached a permanent finish, but the painting can be revised and reworked with heat at any time – minutes or years later. Encaustic paint was first used over 5,000 years ago in Greece when it was used wax to seal their ships. Eventually they added pigment to decorate the boats. The oldest surviving encaustic works are 2000 years old. These are the beautiful and realistic Fayum funeral portraits from Egypt. These were painted in colored waxes on wood and w.ere attached to mummy cases to commemorate the deceased and transport them to the afterlife. The wax has preserved them in near perfect condition. Encaustic eventually fell out of favor because it was so cumbersome to use. Imagine melting wax paint over a wood fire by candlelight! The medium was replaced by tempera painting, fresco, and eventually oil painting. Still, it was kept alive over the centuries by small groups of dedicated artists. Many Impressionists and Symbolist artists experimented with wax. Some of the artists known to use wax in their paintings include Paul Gauguin and George Seurat. My motto for this week: Try something new that scares you!